The equities market opened with a pop, extending Friday's rally, but gave up those gains to hug break-even most of the day. 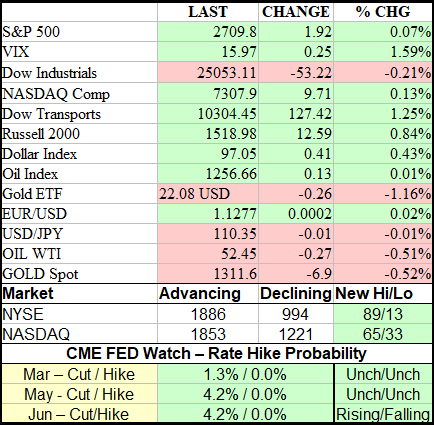 Today's gains were driven on trade-related optimism and may help support prices all week. The fact trade talks are not as far along as the market was thinking does not seem to be a problem so long as there is an appearance of progress. This week's talks between Mnuchin, Lighthizer, and Chinese officials could become a major catalyst for a rally, it just depends on what the headlines are. What they won't be are proclamations a deal has been reached, that is assured. There is a loose rumor that a Trump/Xi summit could happen next month at Trump's Mar-a-Lago resort. This is going to be a big week for economic data. There is still a bit of data due to be delayed because of the Government Shutdown but there will be even more old data the agency's play catch-up. Retail Sales, in particular, stands out, there are two past-due reports and both are on the calendar to be released this week. The government shutdown is back in the headlines. The bipartisan commission to explore an immigration deal has hit a deadlock. If they can't come to some form of an agreement a shutdown is inevitable. A shutdown won't hurt the economy per se but it will hurt outlook and that is never a good thing. There was no economic data today but there is quite a bit this week. 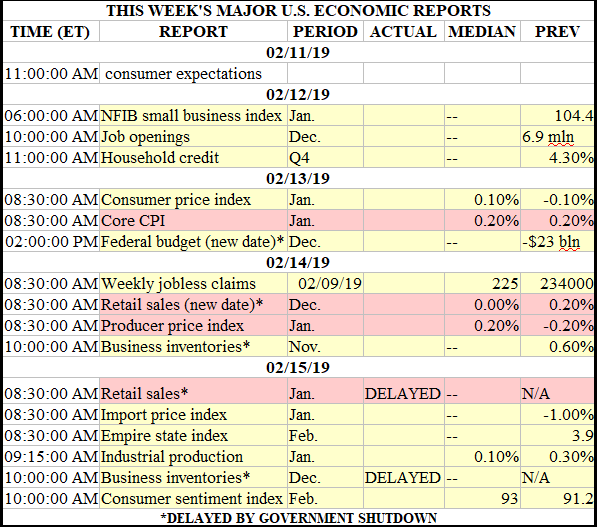 I've already mentioned the two months of Retail Sales figures that are on the list, along with that is the Consumer Price Index, Producer Price Index, Business Inventories, and Import/Export Prices. 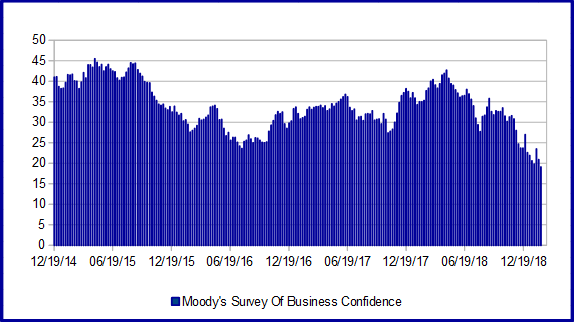 Moody's Survey of Business Confidence fell to a new low in the last week. The reading is consistent with a rapidly deteriorating business outlook, an outlook driven by the ongoing US/China trade way. The sentiment is falling despite optimism a trade deal will be reached and will likely continue to fall until there is better news. 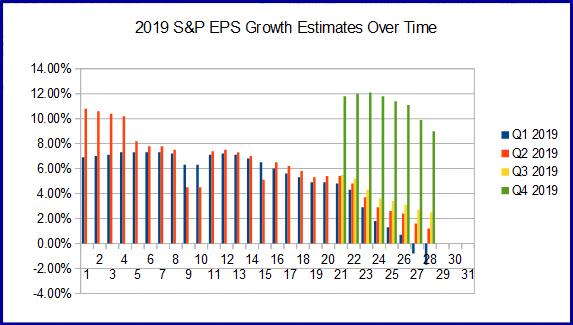 Earnings season has crested its peak and two things stand out; the blended rate of growth for the fourth quarter continues to rise and the outlook for earnings in 2019 continue to fall. The blended rate of growth for the fourth quarter is now 13.3% and likely to improve further over the next 2-3 weeks. The problem is that the average S&P 500 company is only beating by about 3.0% which is below the long-running average. Looking forward the outlook for growth has declined for every quarter in 2019. The first quarter has sunk deeper into negative territory, now -1.7%, but I think the first quarter will be the turning point for indices this year. 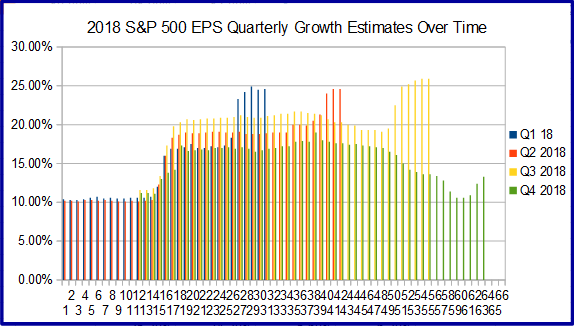 Earnings growth will turn positive as soon as the 2nd quarter, expand into the end of the year and is fuel for a potential rally. The only thing holding that back is the fact outlook continues to deteriorate and will weigh on equity prices in the near-term. There are 65 S&P 500 companies scheduled to report this week. The Dollar Index surged today on a round of week data from the UK. In the UK, the 4th quarter GDP came in much weaker than expected on weakness in every metric. This, along with expectation for at least stable data in the US has the dollar on the move and heading higher. 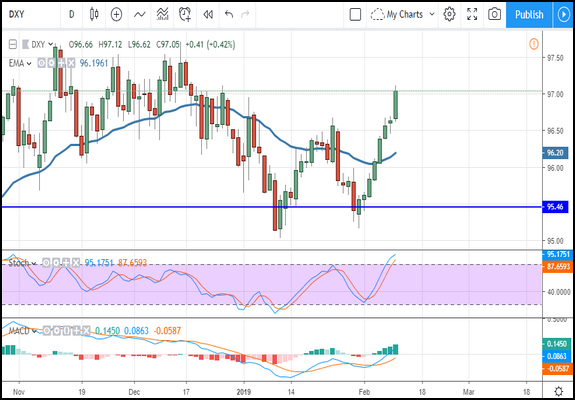 The DXY formed a large green candle moving up from the $96.50 level. Today's action broke $97 so the next target is $97.50. Stronger than expected CPI and PPI could send the index to a new high because it would contradict outlook for the FOMC and rate hikes. Gold prices fell on today's dollar strength and look like they might fall to retest support at $1,300. 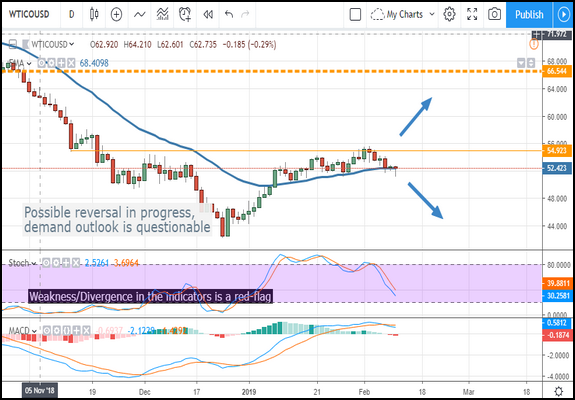 Price action over the past two weeks has formed a peak and set a new lower high, and the indicators are weakening, so a move lower is expected. 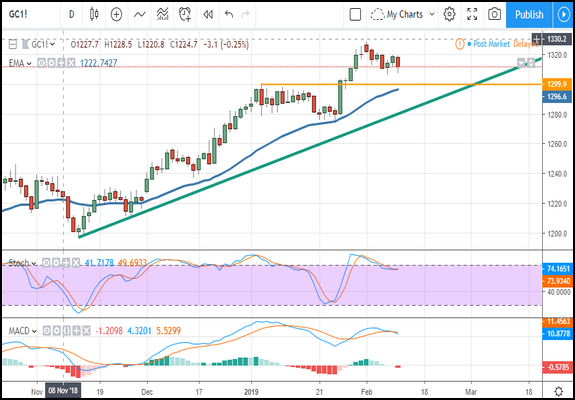 The risk is the data, if the data supports FOMC pause and patience the dollar may fall and gold could resume its upward trend. 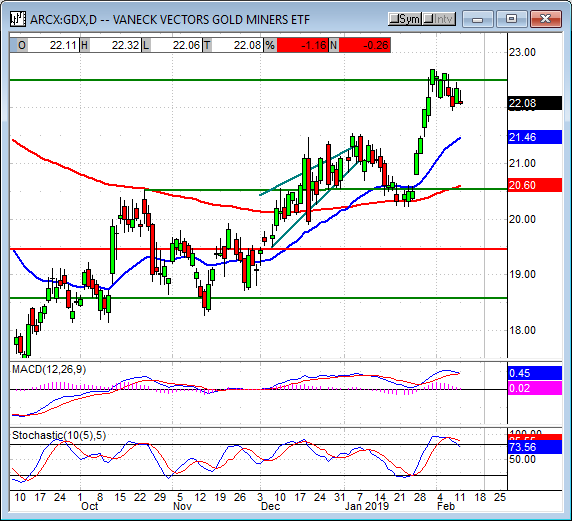 The Gold Miners ETF GDX fell about -1.0% in today's session and is trading just above the $22 support level. 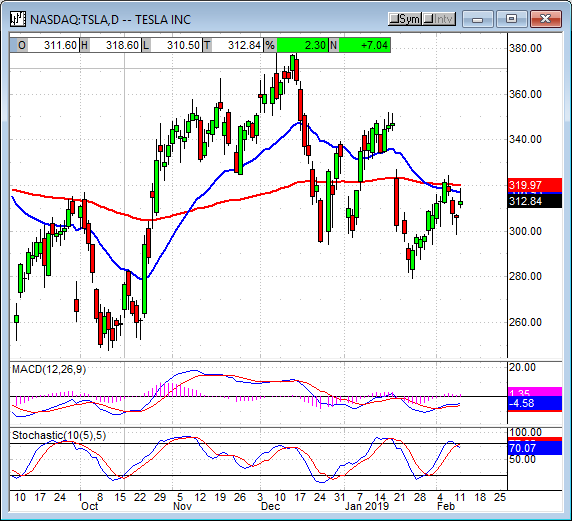 The ETF is in consolidation and may break in either direction depending on this week's data and dollar action. The ETF may fall to retest support near $21.50 if a move lower develops, resistance is near $22.50. The risk is in the trade talks, a break down in talks or another form of bad news could increase the fear premium. Oil prices slipped in today's session as trade fears drag on demand outlook. The price of WTI fell about -0.60% to test support at the short-term moving average. The moving average is near the $52.50 level and the midpoint of the near-term congestion band. The indicators are bearish and suggest a move lower is coming. 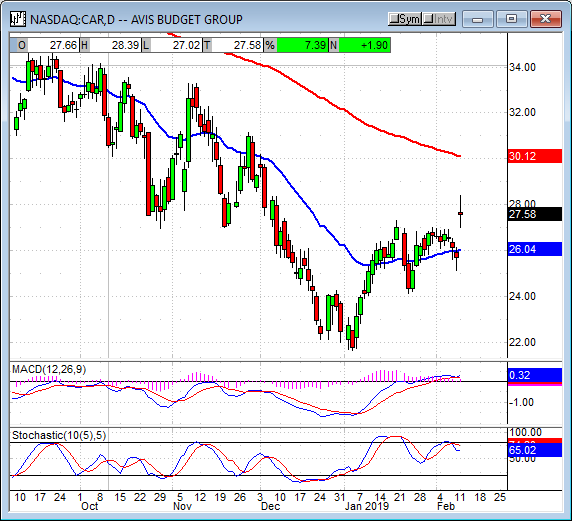 A break below the EMA would be bearish and may lead the index down to $48 or $44. The Oil Index slipped in today's session but was able to regain most of the losses. 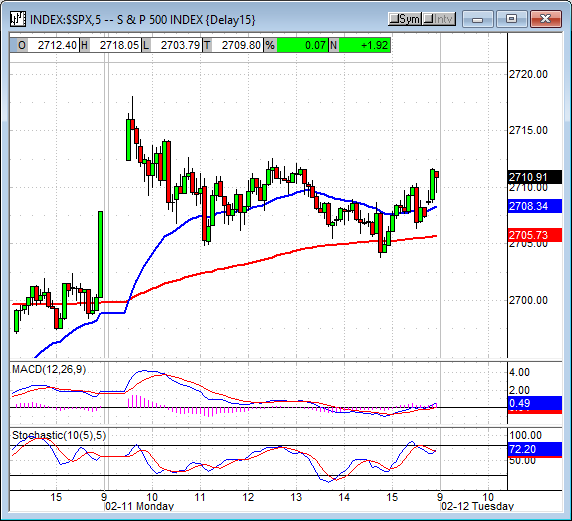 The index is now moving up from potential support at the 1,230 level and may go higher. The indicators are mixed, however, and suggest sideways movement or a move lower is most likely. A break below support would be bearish and could take the index down to 1,200 or 1,100. Tesla received some love from the sell-side community today. First, the Tesla analyst at Wedbush reiterated his outperform rating citing a shifting story. According to him, demand in the EU and sales of the base and low-end models have turned Tesla from a production to a demand story. The profitability picture is much brighter but there are still hurdles. Later, an analyst with Cannacord Genuity upped his rating from hold to buy citing an 'underappreciated' outlook. These good vibes were offset by news T. Rowe Price had sold a large portion of its Tesla holdings in the 4th quarter 2018 but shares were still able to gain more than 2.0% in today's action. Shares of Avis Budget car rentals shot higher on a double-upgrade from Goldman Sachs. The analyst says the set up is good for a significant move, the stock is trading at near a historical low forward PE and could see prices expand on mean reversion and multiple expansion. Shares of this stock moved up 7.40% during the day and drifted higher in the after hours session. The VIX edged higher in today's trading but the move was small, weak, and really didn't do much to alter the near-term outlook. The fear index has been in a steady decline since after Christmas and may be moving lower. The risk is in the indicators which suggest the market is at a low-point regarding fear and that it may spike later this week. With the US/China trade talks set to begin, I'd say that may have something to do with it. 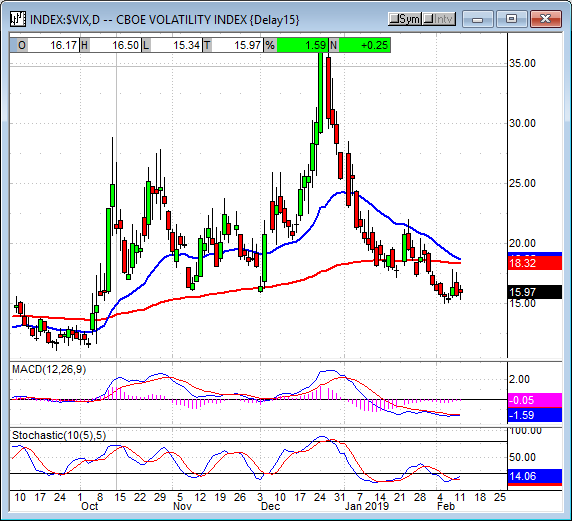 A move up may take the VIX up to $18.50, a move above there would be bullish. Today's index action was largely uneventful except in one case. 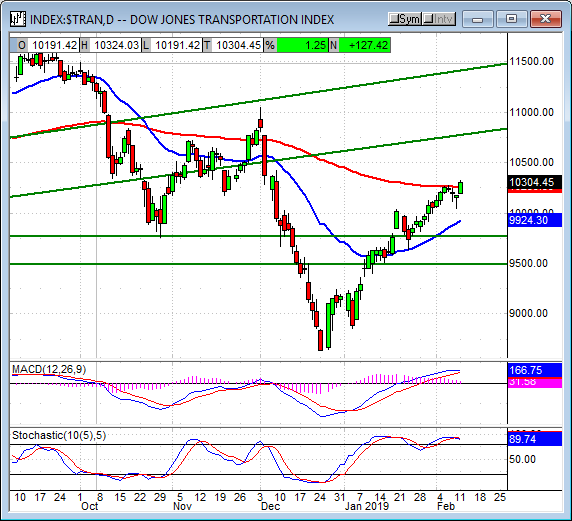 The Dow Jones Transportation Average moved up more than 1.25% to set a new high. 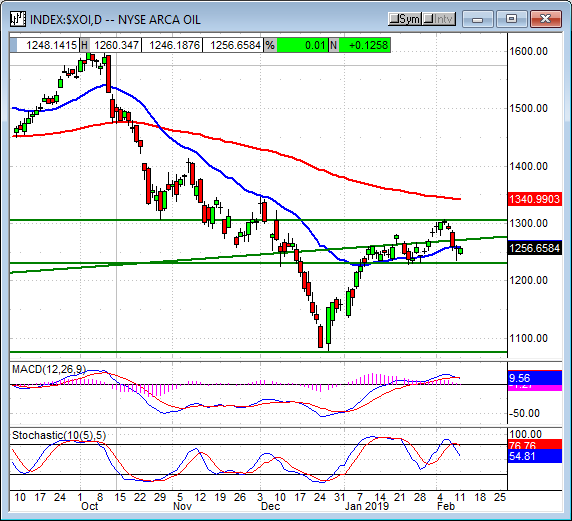 The index is moving up from support at the 10,000, has broken above the long-term moving average, and is indicated higher. The MACD and stochastic are both bullish and suggest upward drift is possible but there is a red flag. The stochastic is showing a peak that may indicate resistance at or near today's close and that may hold prices in check. A move up would be bullish though and could take the index up to 10,500 or 10,750 in the near to short-term. The Dow Jones Industrial Average posted the largest decline but that was only -0.21%. 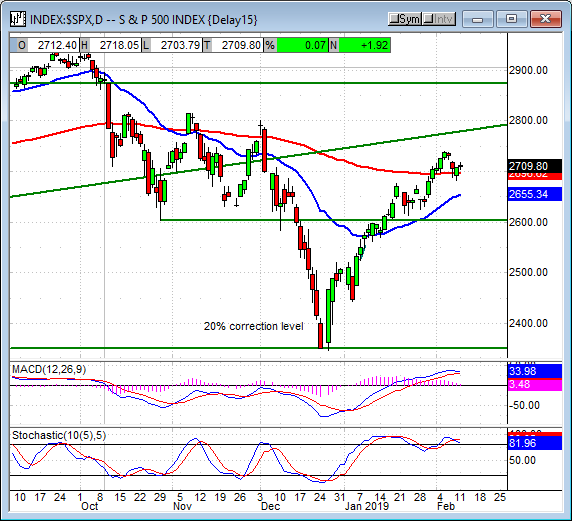 The blue-chip index created a small red bodied candle testing for support at 25,000 and so far that support is holding. The indicators suggest support will be tested again so I wouldn't expect anything to bullish without a catalyst emerging. 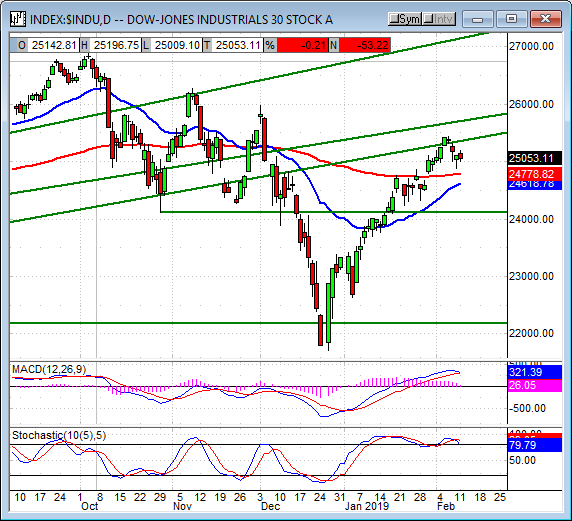 A move lower may find stronger support at the long-term moving average, a move up may find resistance near 25,750. 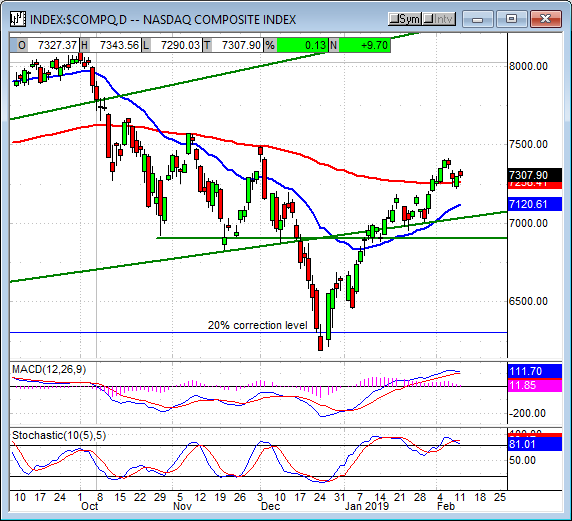 The NASDAQ Composite posted the largest gain with an advance of 0.13%. the tech-heavy index opened with a slightly larger gain but fell throughout the day to form a red candle. The candle is small and weak so not much to worry about but support may be tested before the index moves higher. Support is at the long-term moving average and may be strong, a bounce from this level would be bullish. The S&P 500 posted the smallest advance at 0.07%. The broad market index created a small spinning top doji above the long-term moving average and looks like it may be gearing up for another push higher. The indicators are weak and suggest support may be retested, even broken, but they are also set up to fire bullish trend-following signals should a buying catalyst emerge. A move lower may find support at 2,655, a move up may find resistance at 2,775. The market is hopeful that trade talks will result in good news, at least positive news, if not lead to a firmer date for the Trump/Xi meeting. The bad news is that the talks have reached a high level, high enough that talks could stall out if no resolution to 'wide differences' can be reached. In either case, good news or bad, I expect to see the broad market move sideways over the next three months and possibly move lower to retest the December low. Why, because of the earnings outlook. The earnings outlook for the first quarter is negative, the outlook for future quarters is in decline, and that fact will drag on equities until it changes. I remain firmly bullish for the long-term and very cautiously bullish for the near-term (until the market confirms bearish reversal).